Looking for a way to help your community member base grow? 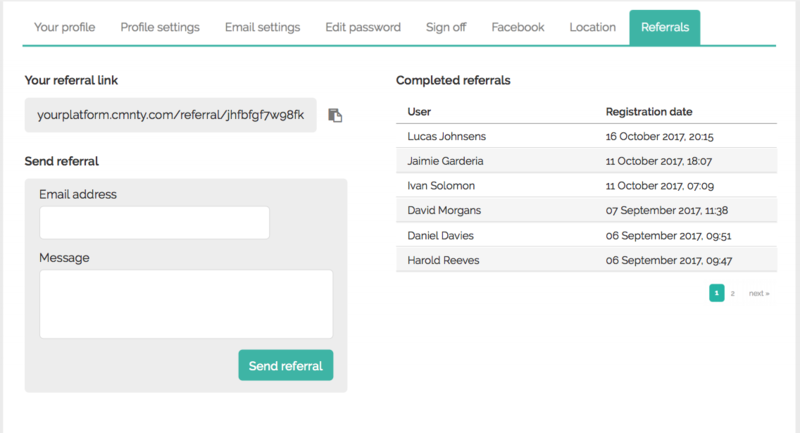 Enable Referrals to allow users to join the community using a referral from a current member. In Admin > Platform Configuration > Options there is an option to enable / disable the referral system. When a guest enters the platform through a referral link, they will be able to register no matter if it’s an open, protected or invite only platform. A member can fill in a message in the front-end and an email address to which the email is being send. The link short code is replaced by the unique link and the message short code is replaced by the message of the member. The user short code is replaced by the one from whom the referral is coming from. A Community Manager can also modify the default email message for Referrals. Go to Admin > Configure > Default Messages > Referrals.